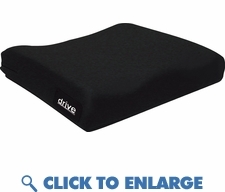 This Wheelchair Skin protection and positioning cushion is made of high resilient mold foam and unique polymer bladders for superior pressure reduction. Each cushion has a sealed inner liner that provides protection from incontinence. The outer cover is removable and washable and prevents shearing and interface pressure to protect the skin. Each cover has a moisture proof urethane backing and a non slip bottom.